Who is that small and prickly creature? Visit a hedgehog mom and her babies as she teaches them to survive on their own. When the sun has set, Hedgehog’s day has only just begun. She’s out and about, snuffling through layers of leaves and twigs as she searches for bugs and other things to eat. Young animal lovers will enjoy following Hedgehog and her little hoglets through towns and gardens, parks and woodland, as they sniff-sniff-sniff for food. The facts threaded throughout this inviting story augment the charming illustrations and will satisfy the most inquisitive of readers. Jane McGuinness received an MA in children’s book illustration from the Cambridge School of Art in England. Prickly Hedgehogs! is her first book. She says, “There’s something mysterious about animals that come out at night, while we’re fast asleep!” Jane McGuinness lives in England. The combination of the delightful large-eyed cartoon hedgehogs, appealing mix of verdant and autumnal colors, and variety of spread, spot, and panel art add to the winning presentation. A truly enjoyable read-aloud on a fascinating topic for early elementary classrooms. 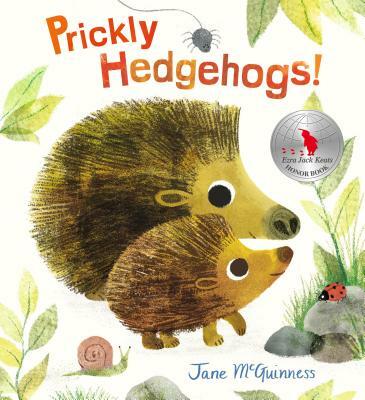 McGuinness offers an entertaining and informative look at this nocturnal creature and her little hoglets.